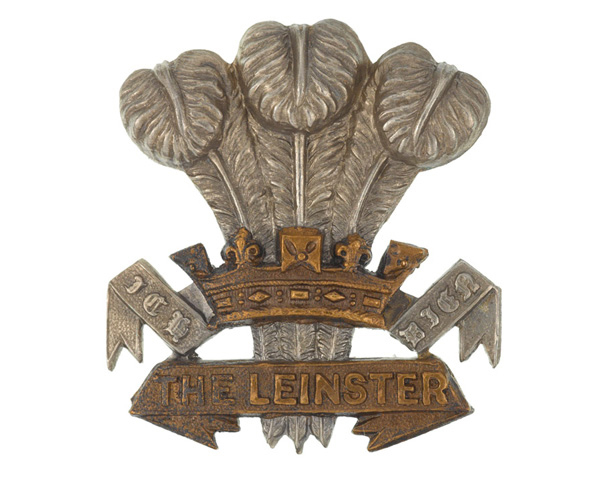 The Leinster Regiment was an infantry regiment of the British Army, which recruited in central and eastern Ireland. Created in 1881, it was disbanded in 1922 on the establishment of the Irish Free State. The regiment was established during the British Army reforms of 1881. The 100th (Prince of Wales’s Royal Canadian) Regiment and 109th Regiment of Foot merged, passing on their historic associations with both Canada and India. It became the local regiment for Meath, Westmeath, Longford, King’s County (now Offaly) and Queen’s County (now Laois); counties in the Irish province of Leinster. The 100th Foot became the new unit’s 1st Battalion and the 109th became the 2nd Battalion. After amalgamation, both battalions undertook garrison duties in England, Ireland, India, Nova Scotia and Malta. The regiment also sent a detachment to the Composite Battalion that fought in the Third Ashanti War (1895-96) and both its battalions served during the Boer War (1899-1902). 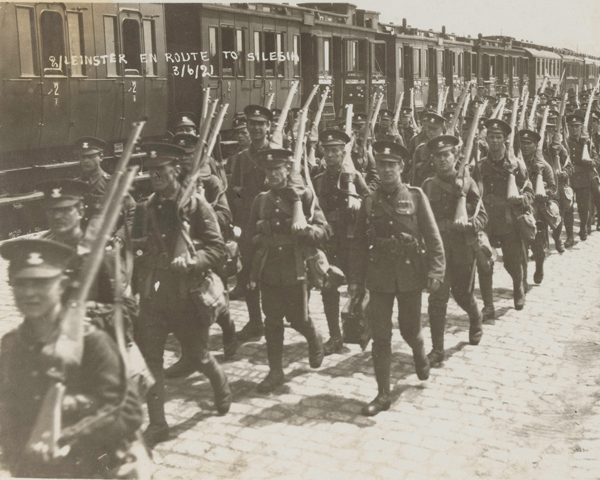 2nd Battalion deployed to France soon after the outbreak of the First World War (1914-18), landing at St Nazaire in September 1914. It remained on the Western Front until the end of the war. In 1921-22, it joined the Army of Occupation in Upper Silesia. 1st Battalion arrived in France in December 1914, but in November the following year it was posted to Macedonia. In September 1917, it moved to Egypt and Palestine for two years, and at the end of the war to India. It stayed there until 1922. The regiment raised two service battalions (6th and 7th Battalions), which served at Gallipoli, Salonika and Palestine. Its three Reserve battalions (3rd, 4th and 5th) remained at home in a reinforcement role. The Prince of Wales's Leinster Regiment (Royal Canadians) were the last British regiment to garrison which country? During the late 19th century, Canada took on a growing role in defending its territory while British forces were gradually withdrawn. 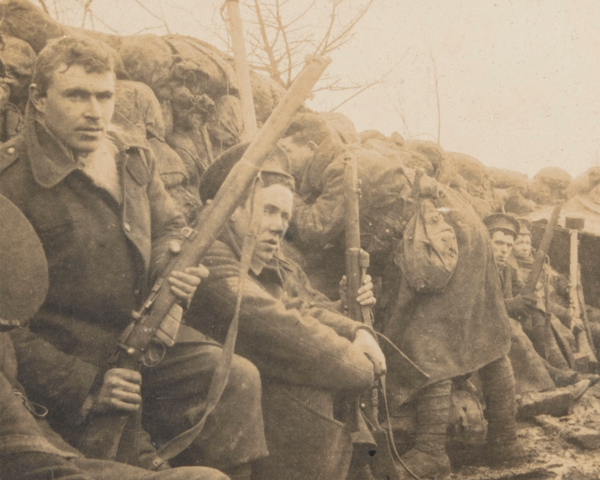 In 1898, the Leinsters began two years' service in Nova Scotia, making them the last regular British infantry unit to garrison Canada. The Leinster Regiment was disbanded in 1922 on the establishment of the Irish Free State. The regiment deposited the Colours of its two regular battalions at Windsor Castle. 1st Battalion presented its regimental silver to the Government of Canada. Search the enlistment books of The Leinster Regiment and the other Irish regiments disbanded from the British Army in 1922. This infantry regiment was raised in Canada in 1857. It continued in service until the Army reforms of 1881 when it was merged into The Prince of Wales’s Leinster Regiment. This unit was raised by the East India Company in 1853, but soon transferred to British Army service. It existed until the reforms of 1881, when it was merged into The Prince of Wales’s Leinster Regiment.